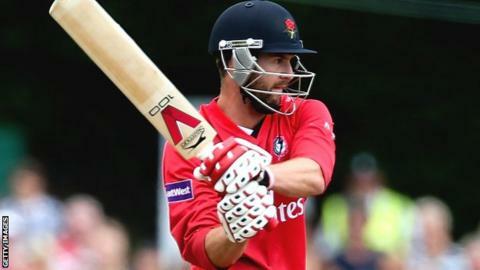 Leicestershire missed out on a One-Day Cup quarter-final place as they lost to Lancashire by eight wickets. Local rivals Derbyshire grabbed the final Group A last-eight spot by beating Gloucestershire. Josh Cobb (58) was Leicestershire's top scorer in their 184 all out, while Kabir Ali took 3-26 - one of five Lancashire players to take a wicket. Tom Smith and Luis Reece both scored 54 and put on 97 for the first wicket, as the hosts won with 20 overs to spare. It was Lancashire's best 50-over opening partnership of the season and Karl Brown added an unbeaten 49 to record only their second win of the competition. Lancashire, who could not qualify for the quarter-finals before the game, finish eighth and Leicestershire have to settle for fifth, after going into the final round of group games in a qualifying position. "Unfortunately, whether it was the pressure of the big game or the ability of the players, we fell short. "The two guys that got themselves in and got themselves out are at fault really as the players who got out at the wrong time. "Because we lost wickets at intervals, we were never really in a position to kick on. That's what really hurt us."